Some speakeasies used businesses as a front– we set up the front entrance as a printing company, complete with huge rolls of paper, books, printing presses and a sliding wall (you can see it here).For no-Maj speakeasies, patrons would whisper through a door opening to enter the building, using the name of the person who sent them. 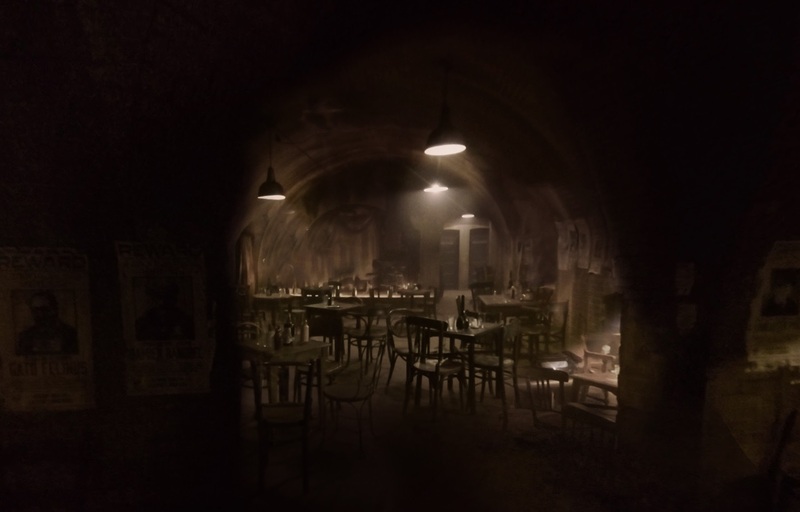 In the case of Fantastic Beasts, the trailer shows them entering through a brick wall from outside, with a lipstick ad that recognises a magical person and allows them in. There are two options. 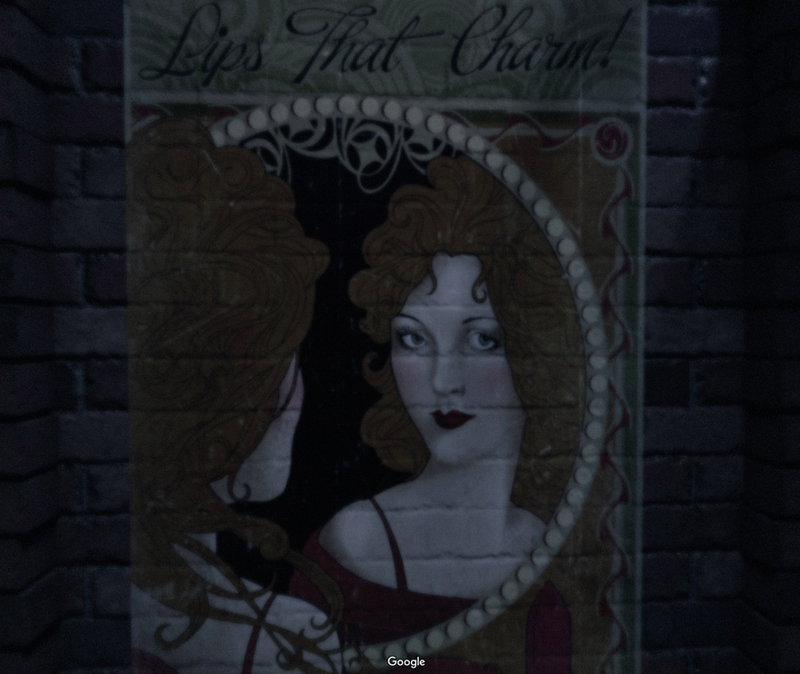 First, the lipstick graphic from The Blind Pig is available on the Harry Potter wiki site (although it only measures 534×920 pixels). Alternatively, there’s a great site called Free Vintage posters. 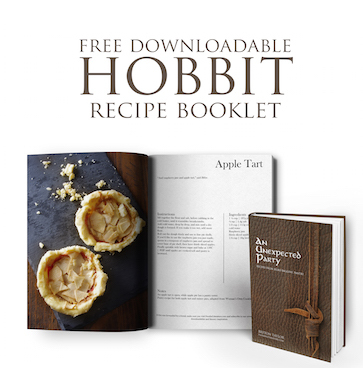 Download one of their files, blow it up to the size you want and stick it to your front door. Once you enter inside The Blind Pig, it’s dark and filthy, so decorate your party accordingly. I’ve recreated the wanted posters based on what photos and screenshots I could find. 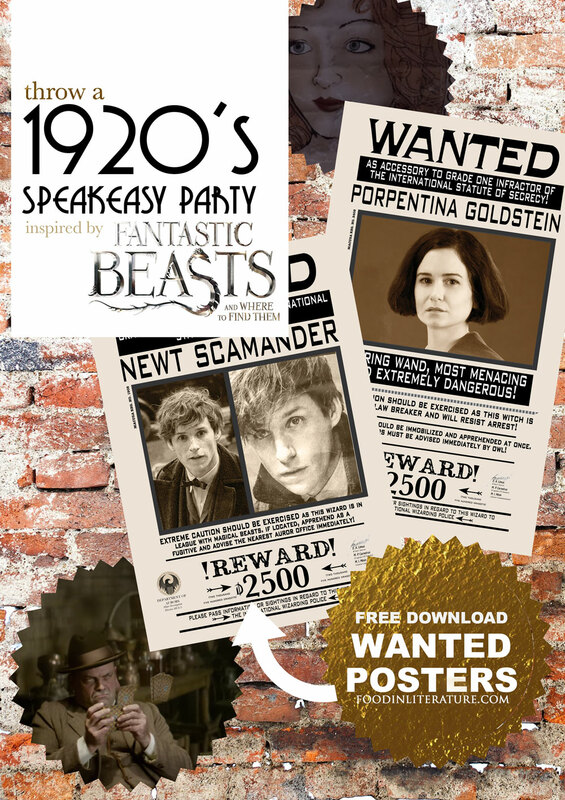 There seem to be promo wanted posters and posters from the movies. So as I find more details, I”ll come back and update these. 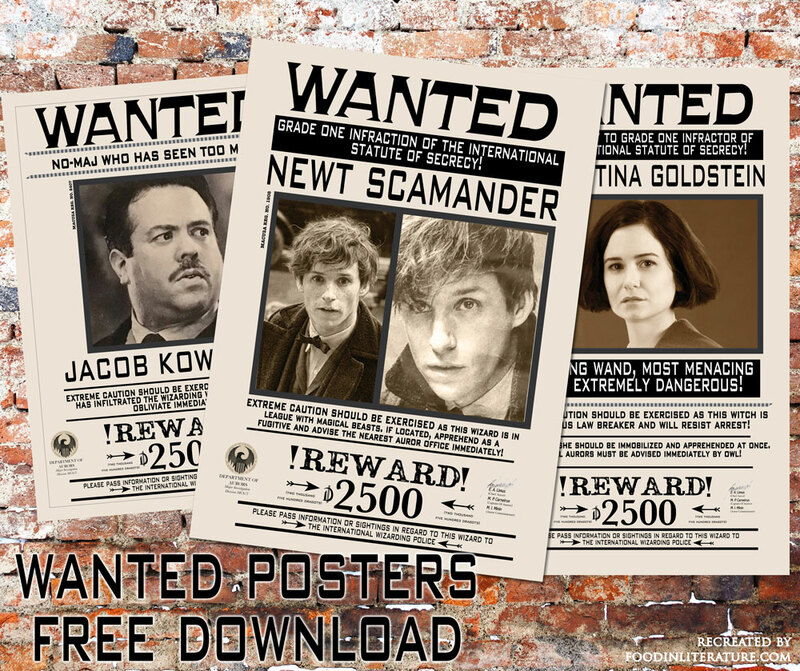 In the meantime, here are three wanted posters for Jacob Kowalski, Newt Scamander and Tina Goldstein. 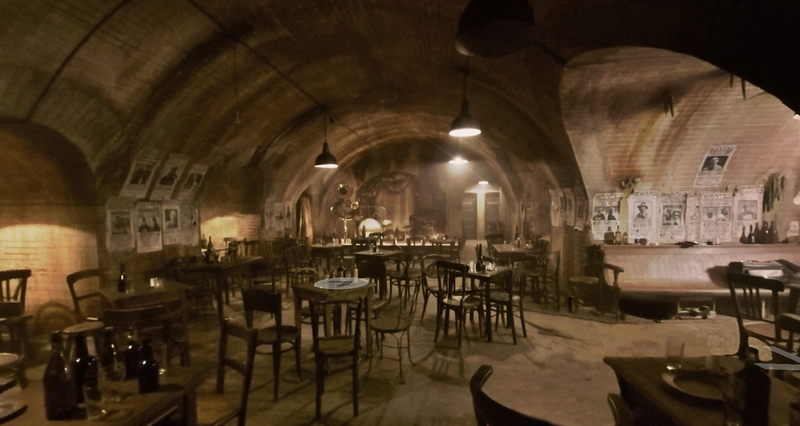 Alcohol and music are at the centre of these speakeasies, so make the bar your focal point. Line up a long high table as the bar and line all the bottles you have up behind it (start saving your empty liquor bottles!) Have an array of glassware for your different cocktails. Our party was Gatsby based, so had a shinier feel to the room. 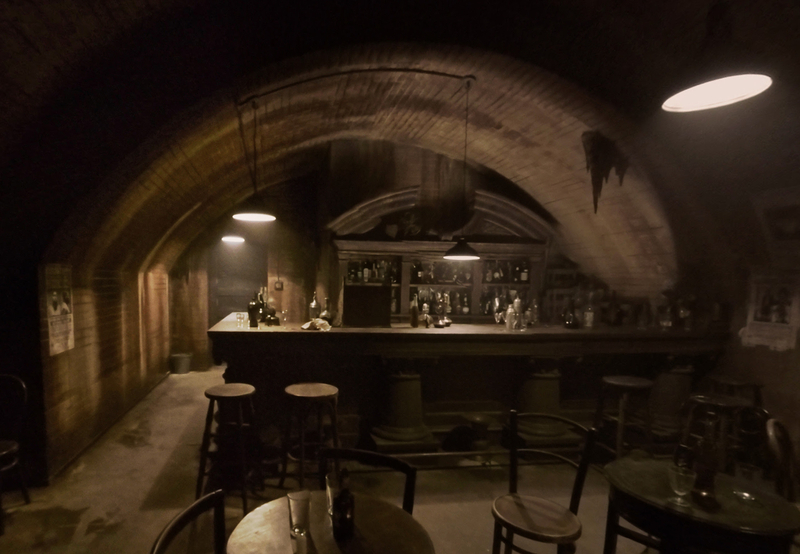 But with the use of dark bookshelves, dark wood tables, dimmable lights and the brick backdrop, you’ll have a bar that would fit right into The Blind Pig. Little tip: champagne was served in wide-brimmed champagne glasses, unlike the tall champagne flutes we use today. If you don’t want to buy glass like these Casablanca Champagne Coupe, try a package of 40 Plastic Champagne Glasses for a larger party. Remove the stems and finely chop up. Add to a saucepan over medium heat, adding the butter and green onions, and saute for 5-10 minutes. Add the flour, nutmeg, parsley, salt and pepper and a splash of water if required. Let cool, then scoop into the mushroom caps. In a bowl, melt some butter, then stir in cracker crumbs. Spoon over the mushroom mixture, then place in oven and bake for 15 minutes. In a saucepan, melt the butter until starting to bubble. Add the cornstarch, salt and pepper and stir. Gradually pour in the milk, whisking until it becomes a thick sauce. In a bowl, mix together the crab or lobster meat, adding in the salt, cayenne and lemon juice to taste. Add in the sauce you just cooked (you may not need all) and stir. Butter the toasted bread pieces, scoop the crab dip on top, sprinkle with grated cheese and toast until golden. In a saucepan, melt the butter until it bubbles. Whisk the milk until it starts to thicken. Remove from heat, then add in the egg yolks and stir. Finally, add in the cheese, salt, pepper and cayenne and stir until it just melts. If too cool, place back on stove. Line a roasting tray with baking paper or a silicone sheet, and pour cheese mixture on to cool. In a deep medium sized saucepan, start to heat up the oil. In one bowl, whisk the egg until the white and yolk are well mixed. In another bowl, have the breadcrumbs ready. Slice the cooled cheese into strips, then dip into the crumbs, egg, then back into the crumbs again. The oil is ready to use when a wooden spoon is placed in the oil, and the oil starts to bubble around it. Place in the breaded cheese strip, fry until golden, then remove and place on a baking rack to drain. other types of canapés, including plain cheese, sardine or anchovy for savoury; peach canapés for sweet. Shake together the ice cube, powdered sugar, lemon juice and gin. Pour into an old fashioned/lowball glass. Top up with soda water and stir to mix well. This recipe is adapted from Jerry Thomas' Bartender's Guide (1887). Muddle together the mint, sugar and water to extract the mint flavour. Add the whiskey and shake well. For this recipe we went back to an original source, Jerry Thomas' Bartender's Guide (1887). A look online seems to have citrus (typically lemon) added in to more modern versions of this cocktail. 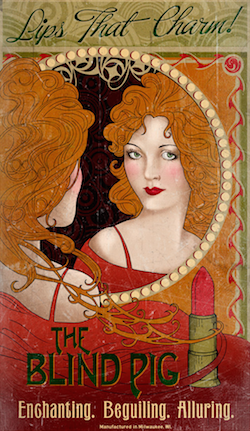 You’ll find flapper dresses on all ladies in The Blind Pig. Don’t own one? Amazon has some super cutes ones at great prices. For men, have fun and take inspiration from Gnarlack, the goblin gangster who owns The Blind Pig. ~ Want more inspiration? We threw our own 1920’s party a few years back which you might want to have a peek at. This post covers the food and some ideas from The Great Gatsby, and this post covers the 1920’s actual party we threw. 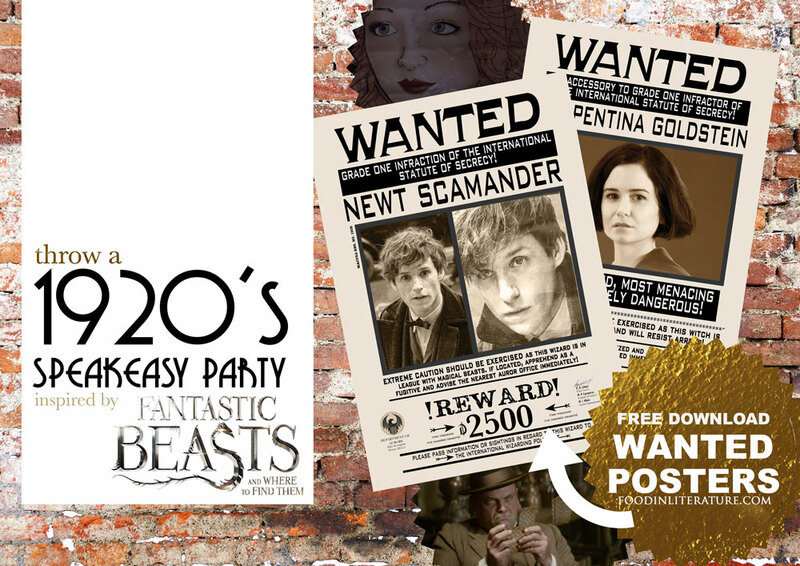 And don’t forget to view the first party inspiration for Fantastic Beasts and Where To Find Them, ‘Welcome to 1920’s New York’. Love what you saw? Don’t forget to share this post around, please!